Friday 25th March 2011: Competition Entries top 35 different players! Sunday 13th March 2011: Frances Colman wins in South Africa! to their efforts at the Ripon Rowles Tournament where the Official CA report describes them as 'the two surprise packages of the Tournament'. Fourteen players made it for today's 'One Ball' introduction / training session and all reported having enjoyed the experience of this 'new' game. Thursday 21st April 2011 (06.30am!) BUNNY TROUBLE! 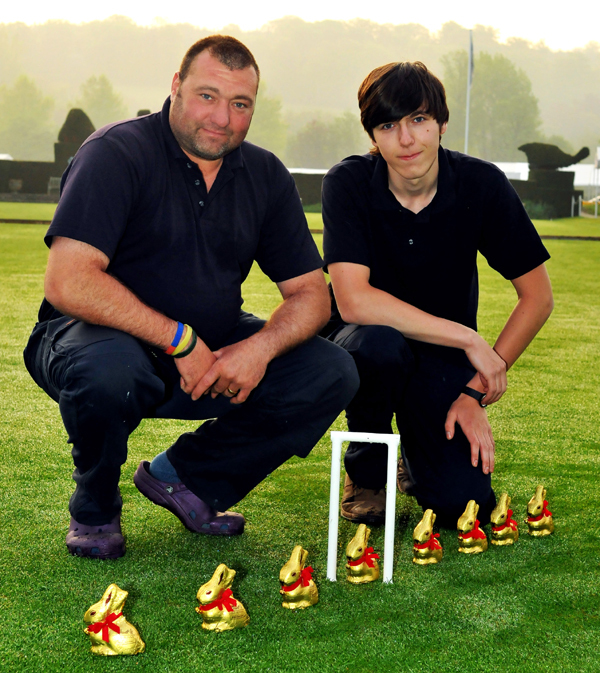 Club members Frances Colman and Chris Roberts had arrived earlier still that morning and set up eight Chocolate Easter Bunnies for Jason and his assistant Tom to find. The Easter Bunnies were a thank you to the gardeners their sterling efforts in presenting the lawns in such wonderful condition - so Happy Easter chaps! Rosie Richardson won the PhyllisCourt heat of this year's Charity One-Ball Championship and goes through to the final, at Winchester on 7th May. All 12 Golf and Association 'Season Long' Competitions playing schedules published & 18 newcomers pass their initial training and a welcome to experienced AC player Harry Midgley. PCC heat winner Rosie Richardson and wild card entries Frances Colman & Chris Roberts all had a great time at The National Charity One Ball Finals at Winchester today. Frances performed the best of the PCC bunch in winning 5 of her 9 games including an epic last match against Marcus Evans (ranked at -10 for the event). 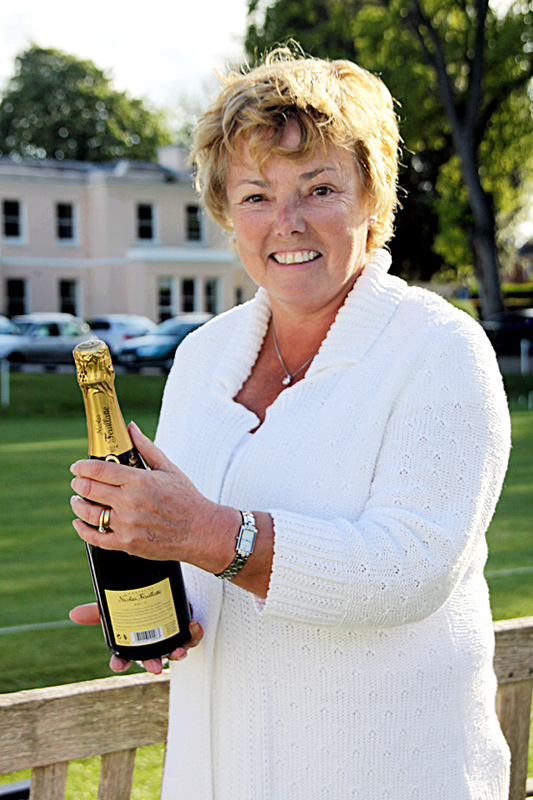 The Inaugural PCC Champagne Open Singles was won by Frances Colman yesterday who recoverd well from an early reverse to claim the first prize of the season. But there were upsets a plenty with John Stanner (starting handicap 7) beating Chris Roberts (2) and Frances (4) on his way to winning his block undefeated. Another over achiever was Dilys Earnshaw (7) who took the notable scalps of Raymond Wood (6) and Helena Fensome (4) and progressed into the Final. Players handicap index points altered quite significantly during the day and John Stanner is to be roundly congratulated for seeing his Handicap ranking move down from 7 to 6. Thursday 19th May 2011: Kathy & Don bag the Champers! on one of the most glorious days of the year so far. Pam Mead (left) reached the quarter finals in top Ladies Tournament Ripon this week and eventually finished 6th - a really good achievement. 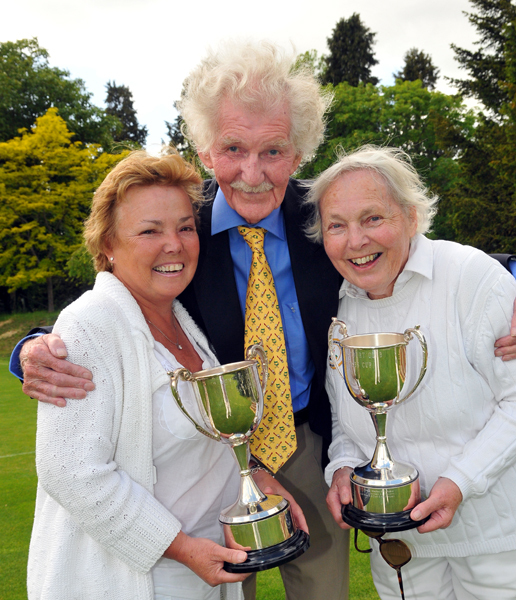 The three day Association Barnses Cups Doubles Tournament was won by Elizabeth O'Dair and Frances Colman this weekend. Also - Paul Kerry (HC 7) has not only been the busiest for our competitions players, he's holding a 100% victorious record. Dianne Brown and Ian Norris can take a bow this week for two great results againist higher ranked opponents. Diane (handicap 9) scored a fine win over Rosemary Noel-Clarke (8) in the 7+ Competition on the back of her earlier Doubles win partnering Bob de Board. Ian Norris had already caught the eye this season, to the extent that Club handicapper Vivain Thomson had moved him down from the 9 to 8 rank, and he replayed that trust in 'the match of the round' against John Stanner (6) in the 'Open'. John took the first game 7-4 but Ian bounced back to take the second 5-7 before the pair went all the way to the 13th 'Golden Hoop' in the last game where John triumphed 7-6 - and it doesn't get any closer than that! President Smokey Eades && June Robinson (Comb HC 12). The tricky Harwell lawns tested our Level League team on Friday but a comfortable 8-4 victory was recorded despite early scares. 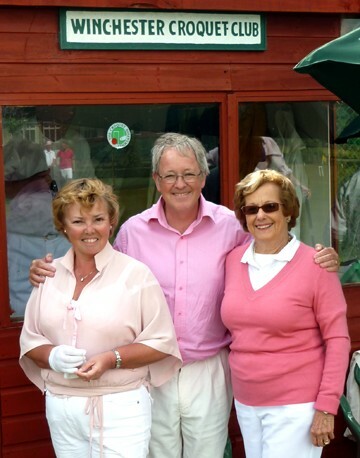 Phyllis Court scored a great win over the Sussex County Club today at Southwick, near Brighton, in the first round of The National Golf Croquet Inter-Club Shield (Murphy Shield). We were slow starters but recovered well to sneak a very narrow victory with all but two of the 19 games played ending 7-5 or 7-6. Helena Fensome playing at 3 for the Phyllis Court team, was the star of the show in winning both her matches. We now face the winners of Watford and Dulwich in the Quarter-finals. 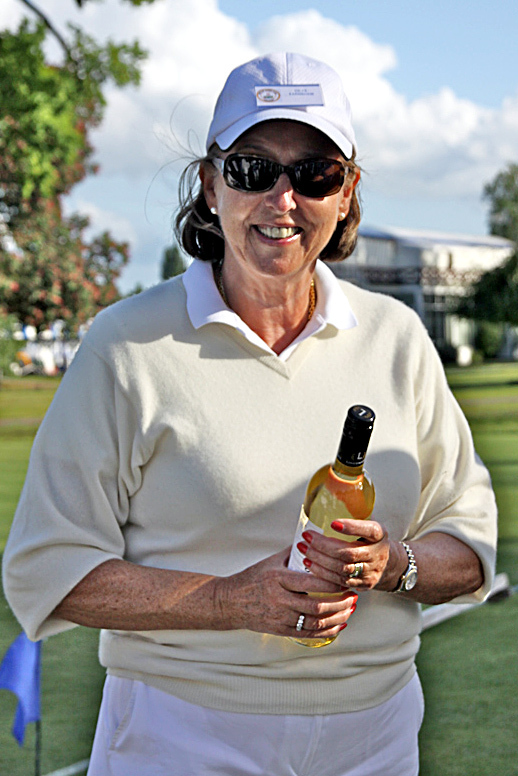 Anne Attfield (handicap 7) pulled off the biggest surprse result of this seasons Competitions yesterday when she beat Chairman Pam Mead (4) in the Open Singles. Buoyed by an unexpected 7 -6 win in the first game, she played her steady blocking and 'nesteling in the hoop' game and despite Pam's partial recovery to take the second game 4 - 7, Ann rallied again to wrap up the decider 7 -4. Pam will get the chance for revenge as the two combattents will lock horns again in the 5+ Singles and Anne has another tricky customer in the 7+ as she now has to face twice winning competition debutant Ian Norris. Today - The 5+ Doubles Tournamnet (The Cave Wolfe) was washed out. A new date will be sought and advertised - watch this space! 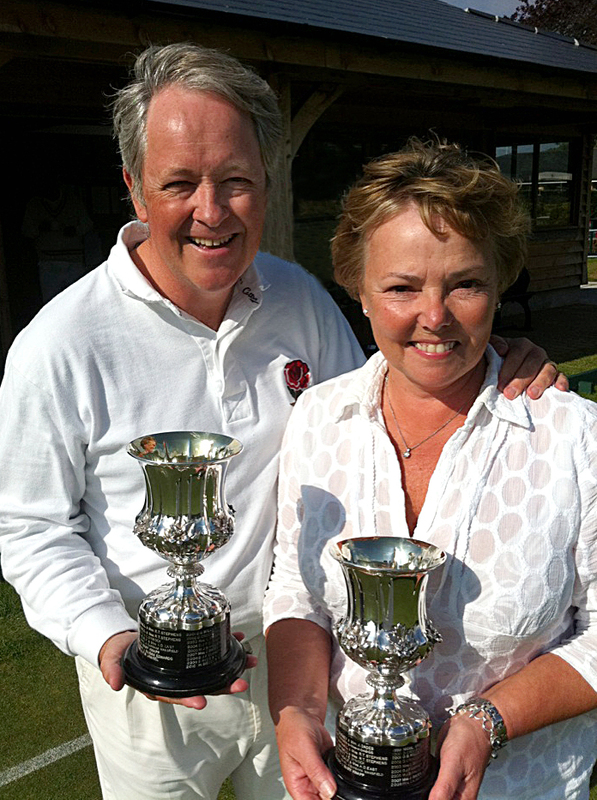 In a super weekend for our Club, Phyllis Court took Southern Federation Golf Croquet Solstice Cup and the Association version, the Armarda Trophy. Charlie von Schmieder and TJ Johanesn (far left) retained 'The Solstice' for a third sucessive year at Hamptworth CC (near Southampton) beating a strong contingent from the Isle of White Club Ryde. The day before, Frances Colman and Chris Roberts (left) dodged the torrential rain to record 'a first' for Phyllis Court when they won (the rather appropriatly named) 'Armarda'. Also this weekend: Raymond Wood's win over Don Rutherford saw him achieve a handicap cut down to a 5. And: Pam Mead again reached the quarter-finals of a Womens' Tournament, this time at Ramsgate, while Helena Fensome reduced her handicap to 3 and won the Consolation Plate. High Wycombe surprised PCC White to inflict a first league defeat (4 - 8) on Raymond Wood's team on Friday. 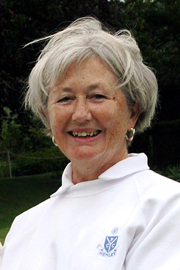 Nina Cox was the host's star in winning both her singles matches and Mary Garynor too contributed two points (one win in a doubles match partnering Raymond and one win in a singles). Captain Raymond found his Association opponent's eye for the long clearence too much and he like Dilys Earnshaw went down to 0-2 singles scorlines which matched that of the second doubles match. Still awaiting news of our Assoc. Team's match with High Wycombe on Saturday. Chris Roberts lead World No.1 Reg Bamford 4-1 in the highlight of a good showing by PCC players at the National Golf Croquet Open this past long weeknd at Southwick, near Brighton. Bamford duly won the maych of course but Chris did beat several lower handicapped players during the tournament. Helena Fensome, Frances Colman & Pam Mead also scored noteable victories and collectivluy Phyllis Court 'fleeced' the field of 207 index points. UK no.3 Stephen Mulliner won the touranment. and Michael Wiles who were second seeds in the 7+ Doubles. The Norrises must now be considdered amongst the favorites in this their first season of competion play - Jolly well done you two! Fielding players with handicaps 1, 1, 2 & 4, Winchester were just too good for our traveling Level League team today. Second pair Helen Fensome (HC 3) & Frances Colman (4) got off to a good start winning both their doubles games and our first pair TJ Johansen (2) and Chris Roberts (2) won one of theirs, giving Phyllis Court a 1 - 3 half time lead. But it all fell apart in the singles with all but one of the eight games going the way of the hosts. Frances recorded a lone victory to save our blushes as Winchester won the match 8 - 4. 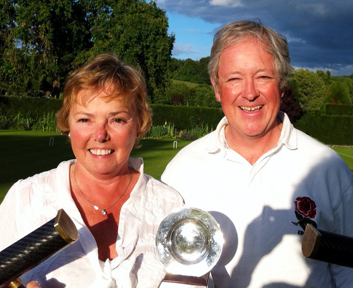 Chris Roberts took the Six lawns AC trophy beating Frances Colman to the title of a very enjoyable three day tournament played at three different clubs. Tomorrow: PCC lawns re-open and PCC White play away at Blewbury. Thursday: PCC 'Inter Club Chapionship' play away Dulwich. 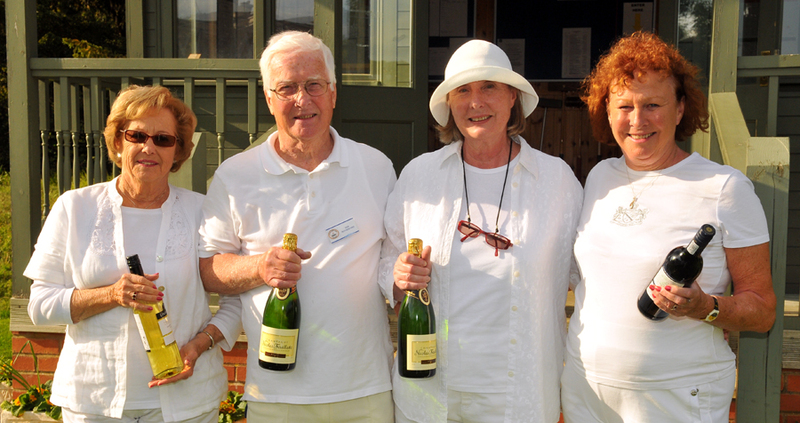 Phyllis Court beat Dulwich 4 - 3 in The Golf Croquet Inter Club Championship Quarter Finals on Thursday 7th July. Without the aid of the coast guard as seemed likely at one point, Phyllis Court scored a narrow victory over Dulwich to progress to the Golf Croquet Inter Club Championship semis. Despite being under standing water only 40 minutes before play, the remarkably well draining Dulwich lawns allowed a full programme of play that most other Clubs would have found impossible to provide. Prior to what turned out to only be a slightly delayed start, the visitors were treated to a splendid lunch with main course by 'Chef du Masion' Pierre Beuadry. Phyllis Court got off to a good start with Charlie von Schmeider (1) and TJ Johansen (2) taking their doubles rubber 2 - 0 against Pierre (0) and Simon Carter (0). Chris Roberts (2) turned the same trick against Mark Ormerod (3) and Frances Colman (4) nearly joined the visitors party but went down 1 - 2 in three close games against Ed Dymock (2). Buoyed (no watery pun intended) by their 2 - 1 half time lead Phyllis Court could see the looming possibility of another Cup upset and sweet victory in revenge for their exit in last years competition at Dulwch's hands. As the sun came out, Charlie & Chris duly wrapped up straight game wins over Pierre and Ed respectively and it was smiles aplenty for Phyllis Court, as although the other two rubbers went to Dulwich, the visitors had done enough. Gracious in defeat, the hosts still wheeled out the chocolate cake for tea and the late appearance of Sue Lightbody to renew friendships with Chris & Frances was equally delightful. Phyllis Court await the winners of the Surbiton v Hunstanton match, to contest for a place in the Inter Club Championship final. There is less than a week to go until Helena Fensome proudly takes her place in the most prestigious Golf Croquet Tournament of them all. Helena will be representing her country of birth Finland and will compete alongside World Number One Reg Bamford from South Africa, UK Open Champion Stephen Mulliner and 10 or more of the fearsome hard hitting Egyptian players who collectively dominate top of the world rankings. We are all really proud that Helena is not only flying the flag for her country but is also giving Phyllis Court a representation at Croquet's top table and several of our members will be attending the Campionships to support Helena at the Surbiton and Hurlingham Clubs. 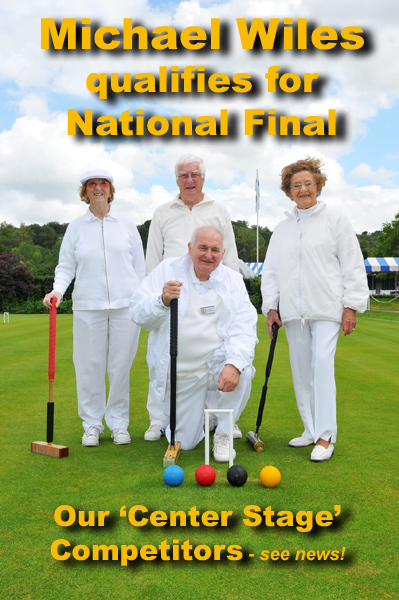 Frances Colman, Chris Roberts & Mike Fensome will be there nearly every day, acting as official scorers, so if you would like to see the best croquet in the world first hand, please contact Chris on 079 7378 7710 and he will tell you all you need to know. Watch this space for daily updates on Helena's progress. There was another surprise in our our singles competitions on Monday when Paul Kerry took the noteable 'scalp' of top seed Helena Fensome in the 5+. In three really long games the pair contested nearly every hoop before Helena peeled Paul through the deciding 12th. 24 hours later Paul was in another three hour match to defeat a spirited Heather Masheter in the 7+. 'Getting her own back' Pam Mead, avenged an earlier competition defeat by Anne Attfield with a win the 5+ and Pam is complimented still further for her fantastic victory in a block match during the Wiltshire Open, when she defeated young Ryan Cabble, the UK's no.6, and eventual winner of the tournament..
Michael Wiles ran-out a very narrow victor in Friday's National 'Center Stage' qualifer Tournament. so got the qualification nod. the head tp head match and so took third place. Our SCF Handicap League teams found Blewbury tough opposition in this last week. PCC White drew 6 - 6 and PCC Blue lost 5 - 7 leaving Blewbury top of the league. On Friday, Raymond Wood's PCC White team scored their first victory of the handicap league season. Proudly representing Finland, Helena Fensome found it tough going against two Egyptian players on Day 1 at Surbiton CC. Blown away in her first match 3 - 7, 2 - 7 against Yasser Esmat, Helena rallied to take her block top seed Amr Baher to 5 - 7 before losing again 7 - 1. But with two of her toughest opponents now out of the way, Helena was still all smiles and looking forward to the rest of the week. Helena Fensome ended Day 2 with her best result so far, taking Swede Jonatan Andersson to the 13th hoop before losing out 6 - 7. This was a good come back by Helena who had sucumbed 3 - 7 in the first of the 'Scandanavian Derby' games. In the morning Helan had found UK no.4 Will Gee too strong and ended up losing out 3 - 7, 1 - 7. So no victories yet but with the top four seeds now played there is still something to be played for in these block games. (the UK no. 11) and Helena held him to a brace of 4 - 7 scorelines. After that Australian Champion John van der Touw showed his class all too well. Tomorrow Helena playes her last block game against Steve Piercy of New Zealand and a good number af Phyllis Court members are coming along to support our clubmate in the wake of PCC Coquet Chairman Pam Mead who attended today. 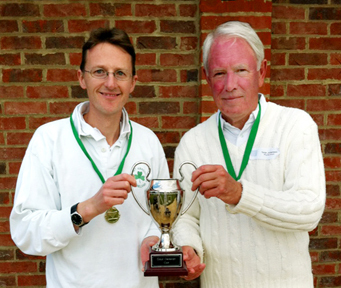 Also Today - News on the home front, that Ian Norris has been 'at it' again - beating a higher handicapped opponent that is - and Anne Attfield was his latest victim as he was the first to progress to the 7+ Singles semis where Alex Earnshaw or Paul Kerry await. Club handicapper Vivian Thomspn has rewarded Ian with a handicap reduction for the second time this season - Ian is now a '7' - really well done! Also Today - The Phyllis Court 'Level Leaue' team travelled to Ryde, on the Isle of White, but lost 4 - 8. Ryde fielded thier strongest line-up with handicaps of 1,1,2 & 2 against our Chris Roberts (2), Frances Colman (3), Raymond Wood (5) and Mary Gaynor (6). We held our own by squaring the doubles games but came unstuck in most of the singles with only Chris winning his two matches. A friendly fixture was played alongside the league game and our team of Don Rutherford, Anne Attfield and Pauline Wood (plus one loanee) reversed the league result to win handsomly. Success at last on Day 4 for Helena who won her first game of the Chapionships against New Zealander Steve Piercy. That was the second game in a best of three match that eventually went the Kiwi's way 7- 6, 5-7, 7-2 and was Helena's only game of the day. With the block play programme now complete, the entire feild will now be cut in half with the first four in each block contesting the Championship at Hurlingham and the bottom half (including Helena) playing for the consolation Plate at Surbiton CC. Several PCC members attended to support Helena today and there is still time for you to catch this top class action at either venue before the event ends on Sunday. Chris Roberts has all the details on 079 7378 7710. Helena was competeing in the Plate Tournament at Surbiton CC today and is in a block of six players. She started the day impressivly with a game win over Sweden's Simon Carlsson to double her victory tally for the week, only to see Carlsson win the second of their two games. Helena then lost twoce to experienced Dennis Bulloch of New Zealand and, in her own words, had 'nowhere to hide' against Egyptian Helmi Abdelgayed. Tomorrow sees another tough test against two very good Englishmen Ian Lines and Nick Cheyene (ranked nos. 8 & 33 in the UK respectivley). Helena's last day of competition was another tough one and saw more losses against Nick Cheyne and block winner Ian Lines. History was made today when Irishman Mark McInerney became the first player in the 15 years of the event, ever to wrestle the World Golf Croquet Championship from the dominant Egyptians. In a perfect display of controlled croquet he took the World Crown from over 50's Champion Hisham Abosbaa in front af a packed gallery at the Hurlingham Club. Phyllis Court's Helena Fensome was still on a high after the wonderful experience of involvement in this, the top event of them all. For the record she won two games and in all played against 12 different players from 5 different countries. Tomorrow - Helena returns to PCC to partner Vivian Thomson against her husband Mike and John Stanner in our Open Doubles Competition. Also Tomorrow - Hurlingham get another visit from PCC when they host us for a friendly fixture against some of their club players. 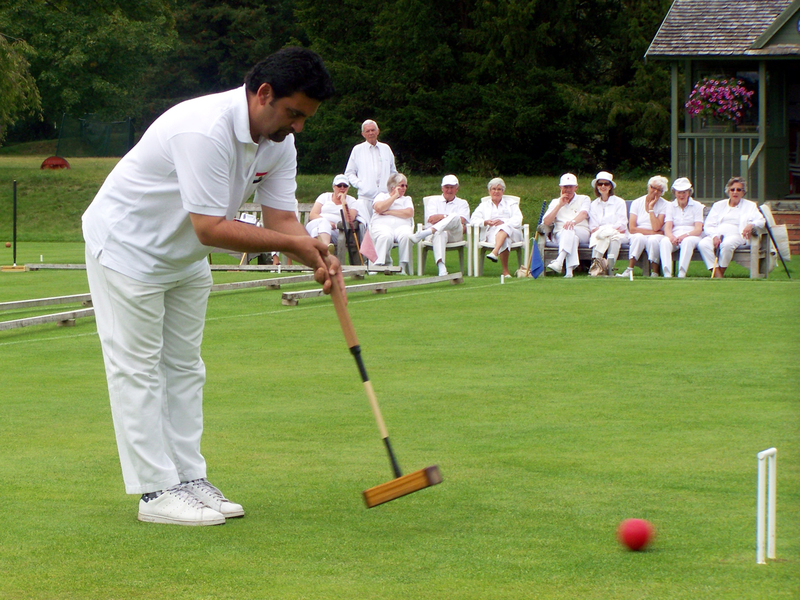 Egyptian International Sherif Nafee wowed the Phyllis Court regulars with an impromptu display of "Croquet, but not as we know it" on Tuesday afternoon. 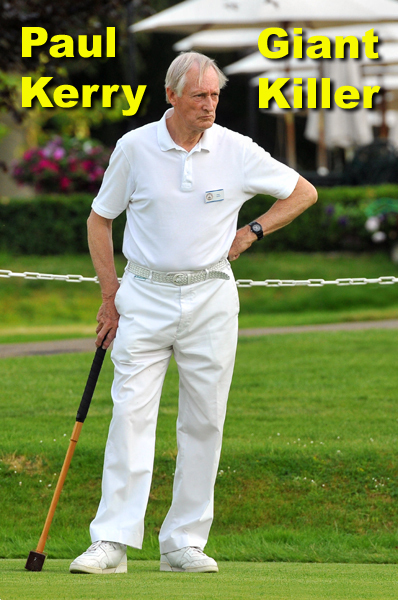 Fresh from the last week's World Golf Croquet Championships, Sherif's hard and super accurate croquet stokes were in marked contrast to the gentle style of the PCC 'All Comers' regulars, who halted their games to see the master at work. The onlookers were open mouthed on occasions as the balls were cracked with pace from one end of the lawn to the other, as is the Egyptian style, and the 20 minute display drew gasps and applause aplenty. Sherif was visiting our Club as a guest of our own World Championship player Helena Fensome, who provided the opposition for the display game. As reported last week, Helena was representing her native Finland last week and had a fabulous time rubbing shoulders with the world's croquet elite (see stories below).